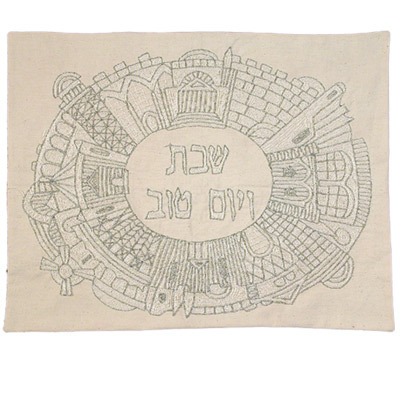 Jerusalem - Silver Oval Challah Cover CAT# CHE-14. Chain - stitched hand - embroidery on raw cotton using various colors of silk, gold and silver threads. Size: 20" x 16". .Kiddush on Shabbat or Yom Tov morning may be fulfilled by reciting the blessing over wine followed by the eating of either challah (introducing the meal) or cake. The latter scenario is typically the case at a synagogue kiddush following Shabbat morning services, or on Shavuot morning when men conclude their nightlong learning session by praying the morning service, eating a light Kiddush of cheesecake and other dairy products, and then sleeping for a few hours before the daytime seudah (meal). When Kiddush is made over cake, the cake must also be covered during the recital of the blessing over the wine, as the blessing over grain products should precede the blessing over wine. Some gift stores (especially in Israel) sell small, decorative covers for this purpose. They are typically embroidered with the logo, ("Who creates all kinds of grains"), the final words in the Hebrew blessing over cake.